Two men with guns have opened fire at a mosque in New Zealand, shooting at children and reportedly killing multiple people. 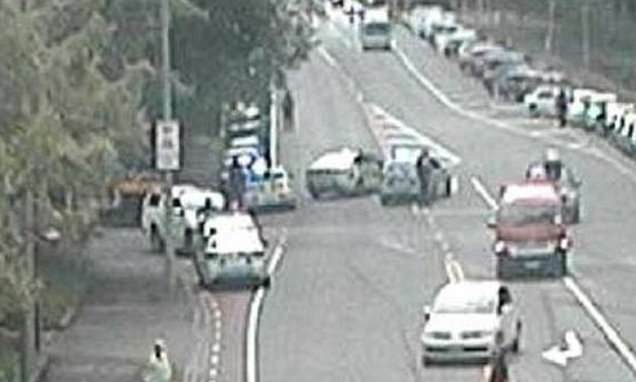 Witnesses reported hearing 50 shots and police are responding to the incident at Al Noor Mosque in Christchurch on the country's South Island. Mohammed Jama, the former president of the Muslim Association of Canterbury, said a man with a gun entered the Christchurch Mosque about 1.40pm local time on Friday. A man inside the mosque at the time of the shooting said there 'bodies all over me'. Several people have reportedly been killed, with a dead body seen near Al Noor Mosque. Witnesses inside the mosque reported seeing 15 people being shot, including children. Ahmad Al-Mahmoud described one of the shooters as being white, with blond hair and wearing a helmet and bulletproof vest. The gunman entered the mosque and opened fire while hundreds of people were inside the packed mosque for Friday prayers. The Bangladesh cricket team - who are currently on tour in New Zealand - were inside the mosque praying at the time of the shooting and were forced to flee for their lives, ESPN reported. A witness told Radio New Zealand he heard shots fired and saw 'blood everywhere'. Mr Jama said four people were injured and that he saw two people lying on the ground. He did not know if they were alive or dead, Stuff reported. There may have been more than one shooter inside the mosque, the New Zealand Herald reported.